I’ve decided to join in on a challenge that stemmed from this post by Jess from Makeunder My Life. 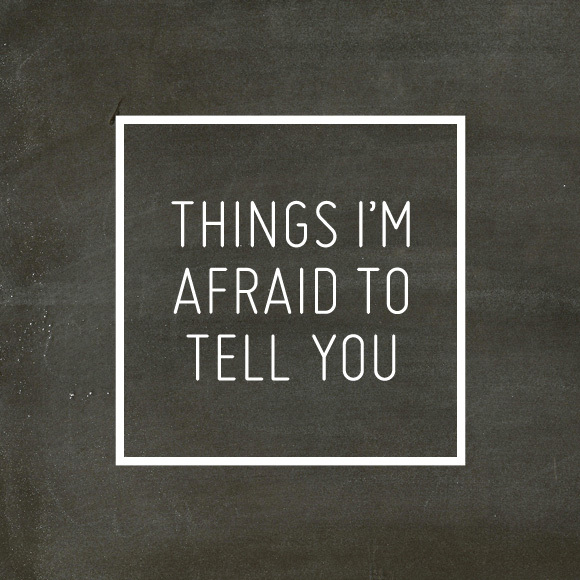 Some 50 other bloggers and myself have decided to air our dirty laundry and just get things off our chest that we’ve often thought about sharing, but might have felt too fearful or uncertain to post. You can find the entire list of participants on Creature Comforts. I feel like I’m pretty open about most things here (possibly a little too much so at times) but I think that it is a great idea to try to keep yourself honest and is a fantastic way to generate conversations about things that you might not always be comfortable bringing up. I feel like this previous post of mine is a great example. I was surprised and amazed by the comments and support I received, something I would not have gotten if I didn’t speak up. I sometimes feel guilty that I am able to stay at home with Joseph. I have many friends who work full time along with raising their children and I know how difficult that can be. I am blessed to be able to do it, but I am somewhat embarrassed to say it. I can’t fully explain why. I watch the soap opera General Hospital. Usually, I DVR it so I can fast forward through story lines I don’t like. It is a guilty pleasure for me. I feel that my husband is more stylish that myself and always ask his opinion on my wardrobe choices. For the most part, I hated being pregnant. I felt like my body wasn’t my own and it frustrated me that I wasn’t able to do what I wanted. It made me realize how fragile my body is and to not take my health for granted. However, I would go through it all again for it was worth it to bring the light of my life into the world. I worry about death and dying all the time. About myself as well as those I love. It terrifies me. One of my biggest regrets is changing my major in college from Fine Art to Visual Communications. I did it because I was worried about finding a job, when I should have stuck with something I loved. UPDATE: I am amazed by how open and honest everyone has been in this challenge. It is a great comfort to know that others have the same thoughts and worries that I do. I want to share a direct link to the participants so you can check out other posts. way to go, sharing these things today! hope you have an awesome day, it’s almost the weekend! Found you through Jess’ MML post and just wanted to comment because: I also have recurring dreams about tornados! They are super scary. Usually, I wake up before the tornado gets to us, but one time it actually did hit. I can also really identify with worrying about death/dying all the time. It is terrifying. Glad to know I’m not the only one though. Anyways, really appreciated you sharing this stuff.